Wood is a renewable natural resource that, if properly treated, maintained and placed in service, will last indefinitely. It is critial for us to use our wood resources efficiently. Wood decay and most insect problems can be prevented for years by properly using and protecting wood. 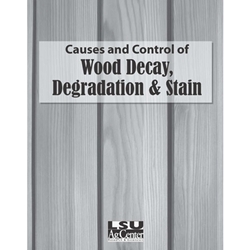 This publication is intended to increase your knowledge of the causes and control of wood decay, degradation and stain.